Join the discussion on our forums! Come discuss Krag'wa, the Frog over in our dedicated Krag'wa, the Frog discussion topic. he looks so happy playing with that troll in the golden art. All I use the Frog for an extra Elise pack, Marin Treasures and Death Knight cards. So much potential here! Really excited to see what people come up with using Electra Stormsurge and Zentimo. Oh my god that golden!!! I love this card...flavor...ability everything. Expensive. That's all i can say. Not so flexable. In game you can probably get 2-3 spells max. Most of the time, you'll get 1 spell. not really impressed. The mana cost means you have to take overload into account, which Burn Shaman is not going to be the way. I also don't really know any non overload spells that work all that well with this. The best case scenario i can imagine is in a Malygos deck where you used some of your vombo pieces the turn before to clear minions and use this to get them back. Doesn't even really work that well with Shudderwock since you'd have to coordinate with the 9-mana as well. You're high. Play any spells the turn before and you just profit with this card. Another Hex another volcanoe another haunting spirit. Just getting 1 copy back of cards like these is incredibly strong, not to mention burn/combo potential. 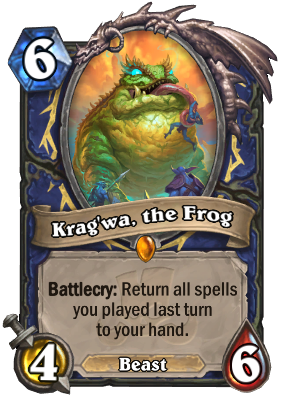 How do you play Krag'wa, the Frog for6 mana, then all those spells to get 22 damage in one turn? "You are one ugly mo...fu..."
My favorite card in Rastakan along with Zentimo. Value card with no RNG? Sign me in. This card can create lots of different decks, you can put this in a control deck, burn deck or combo deck. There are lots of possibilities! Even getting one extra Hex is worth running this card. Did not satisfied? Play Unstable Evolution 9 times than play this. For the next 9 turns you can just play a totem and turn it into a 9 drop. Who would have though Shaman can get good and fun legendaries. if shaman got any kind of spell discount then Unstable Evolution would be the most broken card ever. Now we know that shamans won't be able to overload for more than 4 if they want to get benefit from it. I'm betting Elektra and Zentimo give you back multiple instances of the spell even though you only hard casted one. Voted meta defining, i think this card is just too flexible. Versus agro you coppy boardclears, versus big threats you coppy Hex, versus control you can coppy unstable evolution and forse them out of resources just by summoning 9 drop every turn (totem x9 Evolutions), versus Combo you can coppy some burn finish them quicker. Not even thinking about possible 2 turn kills or combinations with Spirit of the Frog, this card is i think goon it's own.